He planned it all out perfectly. Every last detail. He had the where and the when. A lush garden, to celebrate the romantic holiday. He even planned the details of the how. He had found a dress for her (a hot little black number), to go with the pink suede Christian Louboutin shoes he had bought for her as a Valentine’s gift. He asked her if she would like to get dressed up, have some gorgeous “couple” photos taken, and then go to a romantic dinner together. The perfect date night… complete with the perfect pink heels. What girl could possibly say no to that? When Montee contacted me to take photos of them, and complete his plans for his perfect proposal…. I almost couldn’t believe how well he had everything already worked out. When he and I met to walk the garden and finalize his proposal plans, he told me he was just a romantic at heart and he knew both his own and Jessica’s “love language.” That’s when I knew he was the real deal. Pay attention guys…. you can learn a thing or two about how to make a girl fall head over pink heels, here! Yes, you can be a tough-on-the-outside, and sweet-on-the-inside kind of man. So, a few days before Valentines, we met at the amazingly beautiful Japanese Friendship Garden in the heart of downtown Phoenix. We strolled the garden for a bit to help them relax in front of the camera. They were both so nervous at first, I couldn’t help but laugh a bit because I knew what was coming! We made our way around to the spot where we had planned for Montee to pop the question. I told them to give me a minute to make some adjustments and to just chat with each other. I stepped back away to give them some space, and when I was ready, I gave Montee the “signal” we had agreed upon. I won’t give away all my proposal photography secrets here, but suffice it to say that the whole point is to capture the moment from a bit of a distance, and hopefully they forget the camera is even there (if even for just a brief time). And it worked! Evidenced by the very sweet, soft tears that Jessica wiped from her eyes; the true, genuine way they smiled at each other; and the warm, tender embraced they shared after she said yes. And, in true perfect proposal planning fashion… Montee had arranged for a bit of bubbly to be waiting for them at the other side of the garden. So, while they toasted to their amazing future together… of course I took the opportunity to photograph those perfect shoes – and that HOLY MOLY – perfect ring!!! Oh, and as for the why? Well, after I spent the evening with these two and saw how adorable they are together…. I totally understood the why. These two make one gorgeous couple. But beyond that, they make a fantastic pair. 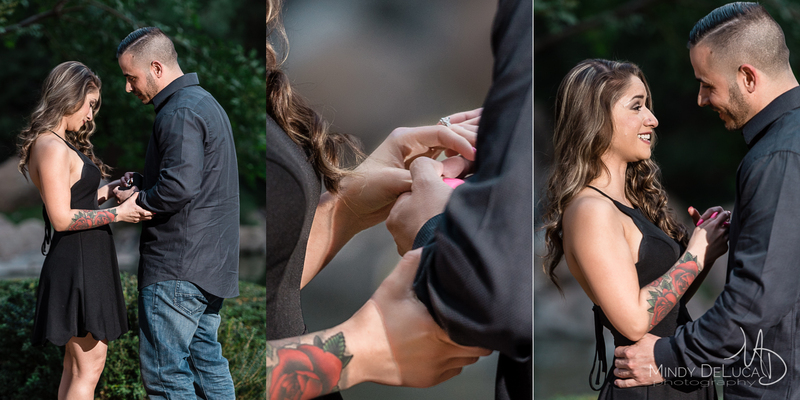 Want to see another proposal at the Japanese Friendship Garden, filled with even more surprises, including a dog, a cake, and a marachi band?? Click HERE. To see more engagement stories photos, follow my blog! Oh my gosh! What a sweet sweet guy! I know, right?! He did SUCH a good job!! Awww, What a sweet proposal! What a stunning proposal. Great job at capturing their love. It really was! Thank you so much! There comes a time when nothing is meaningful except surrendering to love. This is beyond sweet!! I love a proposal, and this is a fantastic one!! Me too Mahlia! 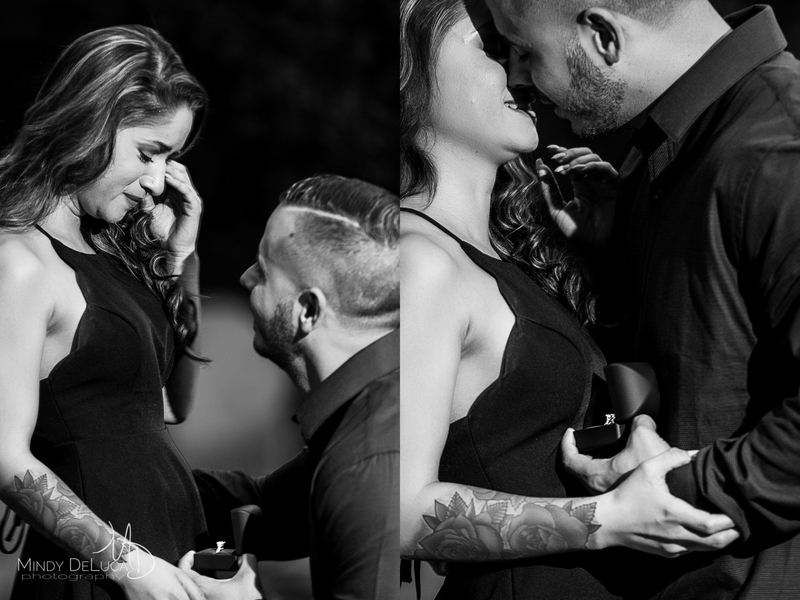 Proposals are sweet, emotional, vulnerable, incredible moments! You don’t get very many of those in a lifetime, so I absolutely adore documenting and preserving them for my couples!! Thank you!! This is such a beautiful proposal! And i love her dress! What a memorable moment in their lives – and you were there to capture it all! I love proposal and engagement sessions. I cannot wait to see this Phoenix, AZ couple’s Wedding photos from you. What a sweet proposal! 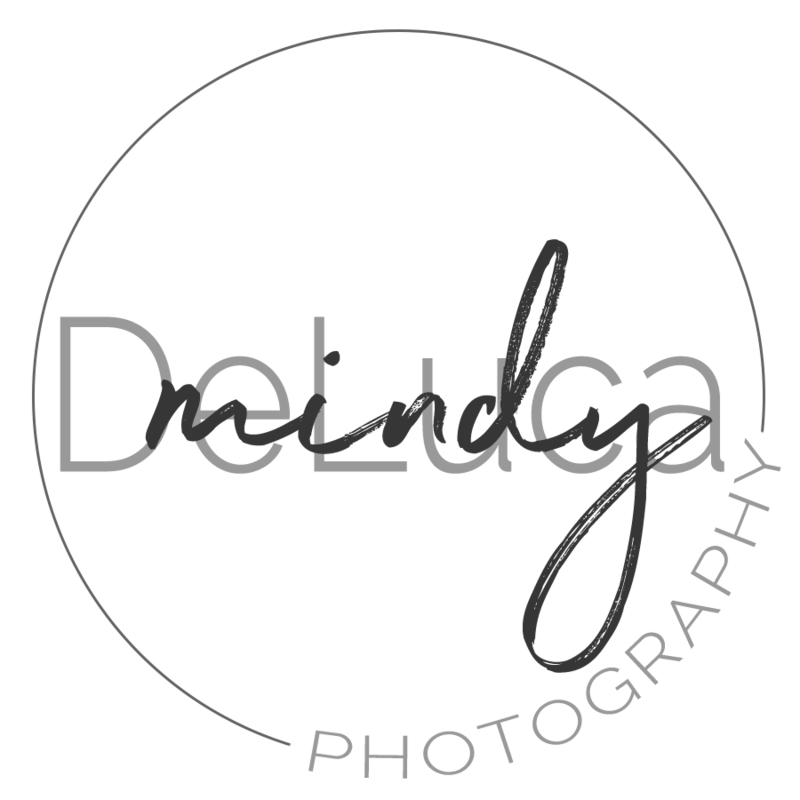 Love the Prosecco too:) Will you also be their Wedding photographer in Phoenix AZ? Great work! Thank you Anastasia, it really was! I am certainly hoping to be there for them at their wedding!